Such a wonderful actress...she added SO MUCH to the show!!! 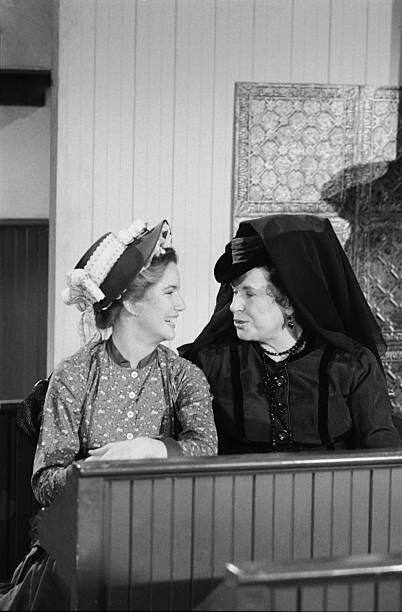 I couldn't imagine anyone else portraying Mrs. Oleson except Katherine (Scottie) MacGregor. 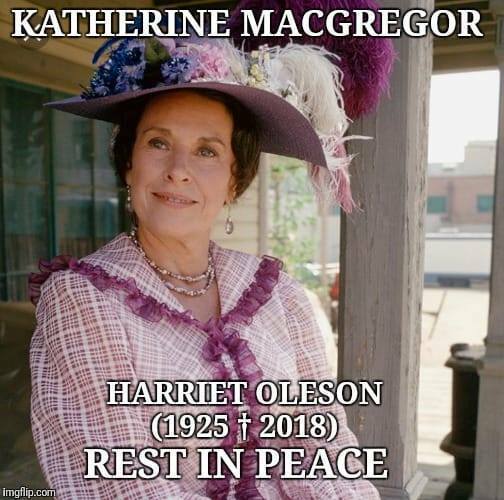 I just got word that Katherine (Scottie) MacGregor passed away yesterday. She was outspoken and hilariously funny. A truly gifted actress as she was able to play a despicable character but with so much heart. Her Harriet Oleson was the woman our fans loved to hate. A perfect antagonist. The thing people outside of our prairie family didn’t know, was how loving and nurturing she was with the younger cast. I really loved her and I find great comfort knowing that she is at peace and, per her beliefs, her soul has moved on to its next incarnation. Farewell Scottie. I hope with all my heart we meet again next time. I had seen it on FB earlier, but wasn't sure it was true. What a wonderful actress. I couldn't imagine anyone else playing Mrs. Oleson. 'Little House on the Prairie' star Katherine MacGregor dies at 93. She had been living at the Motion Picture Fund Long Term Nursing Care facility in Woodland Hills, California, when she died. One of her fellow residents had been Bull; when he died in 1999, she had lunch with his widow, Barbara Collentine. "Little House" actor Dean Butler said that afterward, MacGregor reported "they both had lost a wonderful husband." Born: 1/12/1925, Glendale, California, U.S.A.
Died: 11/13/2018, Woodland Hills, California, U.S.A. I hadn't heard this news. Sorry to hear of her passing.